We asked you if you cared about clean energy. You do. The feed-in tariff consultation has now closed. You made sure your voices were heard. Why we lit up Manchester with George Osborne’s face. Please don't take our sunshine away George. Six ten-year-olds, armed with papier-mache, took on the government consultation. Five years ago Fox primary school was one of the first schools in the country to install solar panels. When the government subsidy that made it possible was threatened, the pupils wanted to send the government a message. The phantom image of a solar farm has appeared overnight on the pavement outside the main Department of Energy and Climate Change offices on Whitehall. 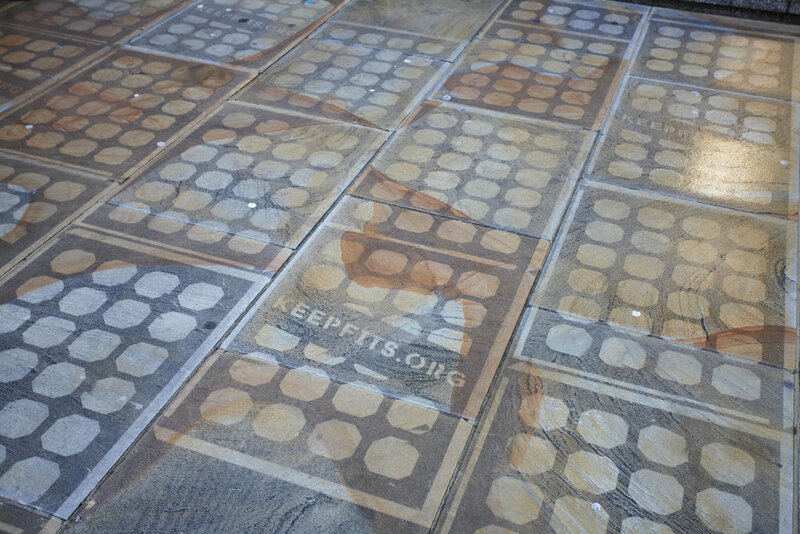 This morning we used clean graffiti to turn paving-stones into solar panels, kicking off our Keep Fits campaign to help ordinary people challenge planned cuts to renewable energy. The whole government consultation process is pretty off-putting to anyone other than a professional lobbyist, so we've developed a dedicated website to make sure everyone who loves renewable energy can have their say on the proposed cuts. Pressure has been mounting ever since the government released their proposal (sneakily, while we were all away on summer holidays). Last week a coalition of energy firms, investors, trade bodies and NGOs published a statement calling on the government to urgently reconsider the proposed changes. And the Mayor of London Boris Johnson is one of several MPs to have publicly voiced concerns over the jobs these cuts threaten, as well as the environmental impacts. “The government’s own figures show there will be nearly a million fewer solar rooftops over the next 5 years if they go through with these cuts. The government wants to pull the plug on Britain’s solar revolution just as it is getting going. Renewable energy is consistently popular amongst the UK public. According to the latest DECC polling, only 1% of the UK public strongly oppose renewables. In contrast a whopping 71% agree that renewable energy industries and developments provide economic benefits to the UK. 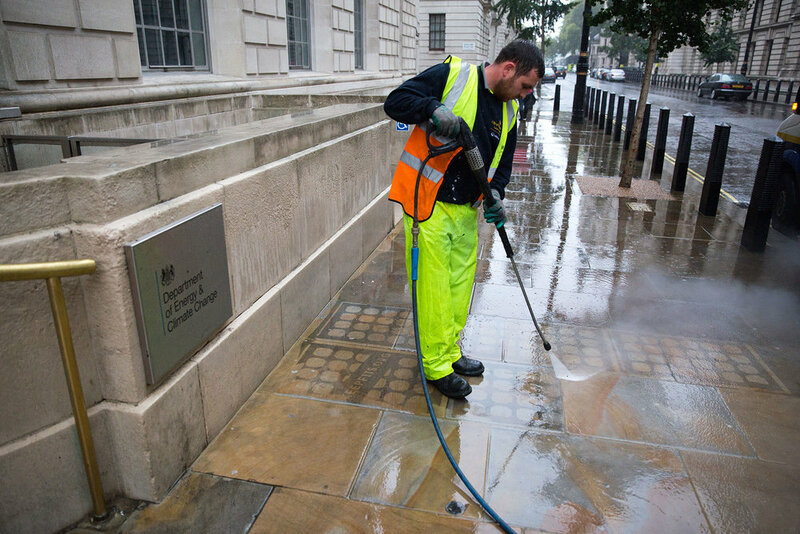 Using high-power washers and a stencil, clean graffiti removes dirt from dirty pavements rather than adding paint. How quickly these ghostly images fade depends on local environmental conditions, but we're hoping they will last right up until the consultation closes on the 23rd October. By lunchtime, the government has washed away solar power from their own doorstep! ”These images speak for themselves - DECC are washing the UK’s burgeoning solar industry down the drain.